Fume hoods are categorized into one of two groups: 1) standard flow, and 2) low flow. Standard flow fume hoods are designed to operate at 100 linear feet per minute (LFM) at 18 inches sash height. (Note that some legacy hoods were designed to operate at 100 LFM at full sash height, as high as 25 inches). Low flow fume hoods are designed to operate at 70 LFM at 18 inches sash height. 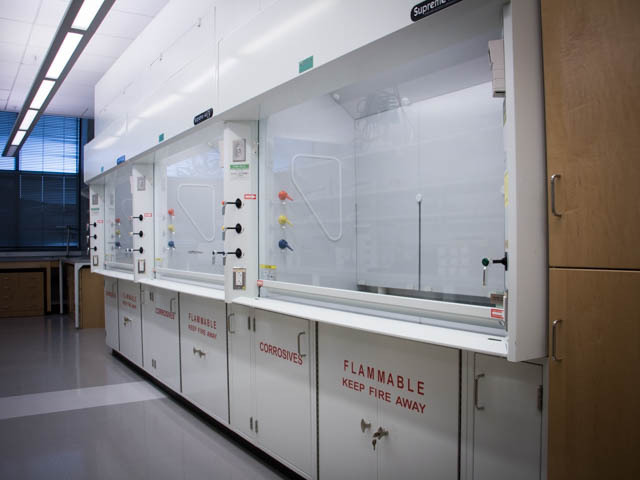 The fume hood can provide adequate protection for most laboratory processes if it is used correctly. The fume hood must be operated with the sash no higher than the red arrow. Detailed instructions for use of the fume hood can be found in the Lab Safety Manual. EH&S performs a functional performance test to assure hoods perform as required about every 18 months. The performance test typically includes an evaluation of the face velocity, the sound, containment, monitor performance and the tracking ability of a VAV (when applicable). EH&S may also note any observed problem with controls, sash, baffles, plumbing, light or corrosion. The following definitions are used by EH&S to track the operational status of fume hoods. If a hood fails an inspection, it may need to be taken out of service until repaired. EH&S will notify the researchers and post a “Do Not Use” sign if repair is required. When UW Facilities has completed repairs, EH&S will retest the hood and put it back in service. Use your fume hood, or other engineering controls, rather than the benchtop when there is a possibility of overexposure to air contaminants generated by a laboratory activity. In the event of lab move out and some services/repairs, lab personnel and researchers are responsible for decontamination of their fume hoods. Complete and post this form when performing fume hood decontamination (UW Form 1803: Notice of Laboratory Equipment Decontamination). Be aware of ventilation system shutdowns and do not use the hood when the ventilation system serving the room is shut down. Be certain you are operating the hood at or below the sash arrows. If the alarm persists, close the sash and wait a moment and then reopen the sash to your working height. If the alarm continues, stop using the hood, close the sash and contact EH&S. If you are having problems with your fume hood, contact EH&S at 206.543.0465. We will troubleshoot the problem and we may refer it to UW Facilities for repair. Repair and maintenance of the hoods is performed by UW Facilities. EH&S is required to help assure that the appropriate hood is selected and that the building's infrastructure can support the installation. Installing and replacing a fume hood may require design and planning, asbestos abatement, decontamination and work beyond simply installing the hood. An evaluation by a mechanical engineer (or other qualified party) and a design is often needed before procurement is authorized. If you have any questions about selecting or purchasing a fume hood, please contact John Kelly at 206.616.3722 or jek@uw.edu. EH&S design guides and specifications are found on the Facilities Project Support page. Is my hood a perchloric acid hood? For assistance in purchasing or locating a perchloric acid fume hood, contact EH&S. Can I use my fume hood during ventilation shutdowns? Laboratories can experience ventilation shutdowns. These shutdowns can be the result of planned maintenance work as well as unplanned events such as equipment failure or power outages. Do not use fume hoods when the ventilation system serving a room is not functioning. This applies to both supply air as well as exhaust air. Inadequate ventilation associated directly with your equipment or indirectly with your room can compromise personal protection. If you have concerns regarding your fume hood during a shutdown or need help troubleshooting issues with your equipment, contact Environmental Health & Safety at 206.543.9510.